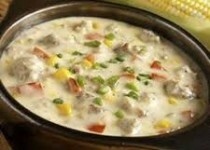 "The combination of fresh corn and turkey sausage is an irresistable flavour combination for your late summer chowder." In a large pot over medium heat, saute onions until soft (5-6 minutes). Add potato, garlic and hot pepper flakes and saute for 2 minutes. Add tomatoes, zucchini, corn and stock. Bring to a boil. Reduce heat and simmer until vegetables are tender, about 20 minutes. Remove from heat and let cool for a few minutes. In a food processor, puree half the soup. 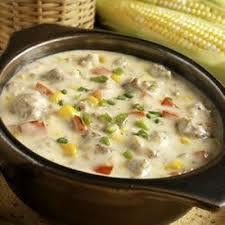 Return the pureed soup to the vegetables in the pot. Stir in milk and bell pepper. Reheat over medium heat until steaming. Optional: Pan fried turkey sausage or sausage pieces, drain, chop, stir into soup before serving or garnish with crisp smoked bacon bits. Serve in warm bowls.